Going green extends beyond any recycling campaign. It’s a conscious choice to take a stand against what’s convenient, and instead become wise stewards of the environment we live in – one that sustains us, our families, our communities and generations to come. 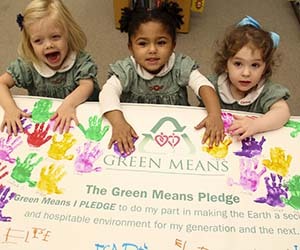 Green Means I PLEDGE to do my part in making the Earth a secure and hospitable environment for my generation and the next. 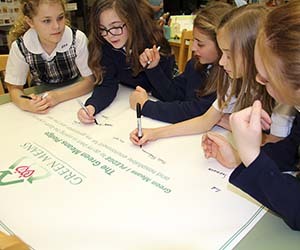 Campaign helps students, teachers, administrators, staff and parents to be good stewards of the earth’s precious resources. The Green Means Committee helps to educate, coordinate, analyze and communicate positive changes to our campuses and in our curricula. That the school teaches respect for creation and prepares students to be stewards of the earth’s resources. That the school educates to a critical consciousness that leads its total community to analyze and reflect on the values of society and to act for justice. That in our multicultural world, the school prepares and inspires students to be active, informed and responsible citizens locally, nationally and globally. That the school promotes a safe and welcoming environment in which each person is valued, cared for and respected.